anCnoc (aka Knockdhu) has released a number of NAS whiskies in recent years, but they've kept the 12 year old well-stocked and well-priced. Its average US price tag falls in line with Glenfiddich 12, Glenlivet 12 and Old Pulteney 12, and about $8-$10 more than Tomatin 12. One thing that sets it apart from those other malts is it's neither artificially colored nor chillfiltered. I'm not sure how many low-priced official single malts can claim the same presentation. Review pour of US edition was taken from top third of the bottle. Nose - Citronella, honey and Sugar Daddy candy make up the foreground. A considerable nutty Parmesan-Reggiano note lingers throughout. Fresh pears and apples in the background. Palate - Fruitier than the nose, lots of plums and nectarines. Has a bolder bite and delivery than Glens Fiddich and Livet. With time, it picks up a slight floral thing, then lots of lime and fizziness. Finish - A little floral, a little toffee, a little ash. Lots of lemon, grapefruit and ginger ale. Nose - Still with the parmesan. Fruit is pushed further back, but caramel candy comes forward. A little chalky. The citronella slowly comes back together, T1000-style. Palate - A zesty herbal bitterness arrives quickly. Pretty malty overall. A nice creamy citrus note, too. Finish - Malty and sweeter, but shorter. Nose - Lots of caramel candy upfront. Milk chocolate. Kinda like Milk Duds, I think. With plaster. It gets peachier with time, then some malt and salt show up. Palate - Thinner texture than the US version, but it has the same fizziness. And, curiously, more heat. Quicker, tarter fruit. Caramel candy. And LOTS of bitter hoppy IPA. Finish - An IPA with more heat. So much grapefruit and hops. Hints of dried grass and milk chocolate. Compared to the aforementioned decently-priced 12 year old single malts, I'd put this slightly ahead of Glenfiddich 12 and Tomatin 12, and waaaaaaaay ahead of Glenlivet 12. While it's a casual drinker, anCnoc 12 does have some nice crisp fruit and a good challenging edge to it. 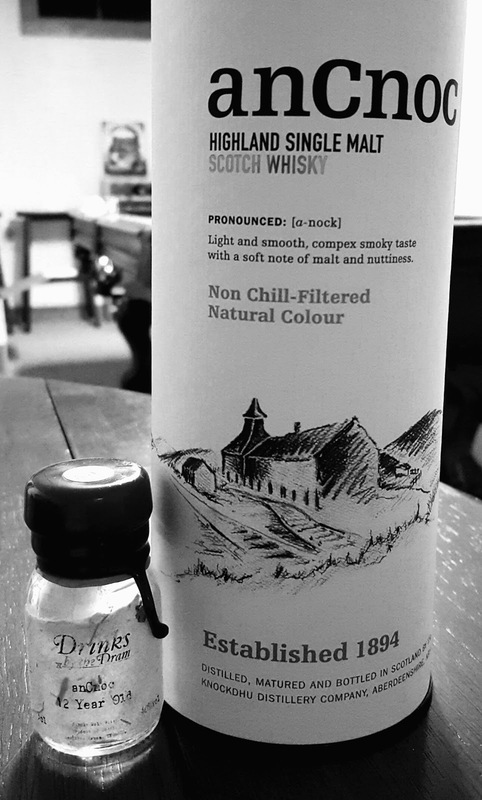 Old Pulteney 12, while being a much different whisky, has bold lines and noticeable unique (distillery?) traits as the anCnoc 12 does. So they'd rank somewhere around the same level, in my opinion. Neither whisky will move you, emotionally, but each deliver a little something above average. Now that references the US edition only. The 2012 European edition is okay, a totally acceptable whisky, but more than that. I don't know its difference is due to dilution or filtering or coloring. The edgy IPA character keeps it from falling into the 70s grade-wise. The US edition still wins out when it's diluted to 40%abv, and feels like it could take a little more water too. I might experiment with that further. If anything new is discovered, I'll provide updates in the comment section. Overall, anCnoc's 18yo is a superior whisky, but if you're in the US and can find this 12yo for less than $40, it's a reasonable drink for the dollar. AnCnoc 12 and Old Pulteney 12 have both jumped over Glenmorangie Original for my starter whisky recs. Like you say, they're not going to blow anyone away, but they're extremely solid values. Also, I think, people who like AnCnoc 12 and Old Pulteney 12 right from the start will have good luck when moving to crazier whiskies. Those two whiskies aren't featureless single malts. If Benromach 10 were $10 to $20 cheaper a bottle (it's presently $49.99 where I am), I might consider making it my regular house single malt. It's still a whisky that might be a bit challenging to beginners though. The arran 10 is in this range also non chill and natural color. I just notice a 43% ABv acnoc 12 was missing the non chill, nat. color statement missing on bottle in new Hampshire liquor store? Glen garioch 12 and craigallachie 13 here I come.